Record Club is a great night out for people who like music. … and we thought ‘yeah!’ After a few tests we started to run regular events later that year, throwing open the doors of the Kirkgate Centre in Shipley, West Yorkshire every month to anyone interested. Fortunately quite a few were and we spent 6 happy years running our events there. In October 2017 we moved to a new home just around the corner at The Triangle in Shipley and now hold events on the first Saturday of the month. So, it’s a club, yeah? Umm, not really. We just like the name and it stuck. There’s nothing to join, no rules as (well, apart from one…). Just turn up and say hi. With or without a bunch of records! We play records! Or just listen to them. The nights themselves are friendly, relaxed affairs where people are encouraged to bring along records from their collections for the enjoyment and illumination of others. It’s a rare night when you don’t walk away having heard something amazing you’ve never come across before! As well as music and excellent company there is always a fine choice of beers, soft drinks available to buy. Think of it like a friendly pub but with great music and no fruit machines! Most events are themed in one way or another. Depending on the theme for the night it could be whole albums, singles or a combination. We normally nail down the theme a month or so beforehand. You can find out what the next theme will be by attending the events, checking our upcoming events page or the rolling blog on this site. Or out in social media land follow the Twitter, Facebook and Instagram feeds. Love the virtual thump of email in your inbox? We also have a good old fashioned mailing list. Subscribe here, no spam. To keep the music varied and interesting we mostly (not always, mind) avoid themes by genre, so we tend to go for nice broad topics which can encourage people to dig deep and think laterally. To get a flavour, you can find out what our previous themes have been by looking at our past events page. Occasionally someone will offer to run much of the night, especially if they have a theme they really want to explore. Alternatively, our very popular free-play nights encourage as many people as possible to bring stuff along all based round that night’s theme. We can quite easily crack through 50 tracks on a night like that. Can I bring CDs and MP3s along? But don’t let that stop you coming along and hearing other people’s records! And not everyone who comes along actually owns a record player or any records. Or wants to play them. Anything else you get up to? Since December 2015 we have had our own BCB Radio show every four weeks, called… wait for it… The Record Club Radio Show! Often this will mirror our most recent theme but we’re not averse to just playing stuff cos we like it! Rob runs the programme with a rolling group of co-presenters, most of whom regularly come along to Record Club and we’re always looking for new recruits to join. 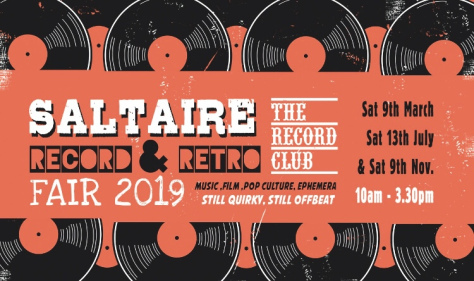 We also pop-up in places from time to time, getting involved in Saltaire Festival in 2016 and 2017, supporting local record fairs and helping to celebrate the odd birthday. We really like doing these and we’re always looking for excuses to get the decks on the road with a crew. Get in touch! Record Club wouldn’t exist without them. All the events are based on your ideas. If you have any suggestions, then let us know. You can also nominate interesting people who could run an event, or records that could be played. Maybe you want to dig into your record collection and play them for the pleasure of others? With your input, Record Club should be a varied and enjoyable night out. So, if you’d like to get involved, we’d love to hear from you. If you just want to turn up, then do that instead!